This week's doorway is on Cedar Lane Way on Beacon Hill. Lovely compostion. Isn't it a bit narrow to be a double door? Beautiful door, but how do they get big furniture in to the house?? Superb doors - I like the lanterns the most! Beautiful door.The number 36 is also a cool number, don't you think? I'm curious about the decoration for Christmas in Boston city! The door is very unusual, I think. It is indeed very narrow, or so it seems. The two door knockers are necessary, but they and the hanging corn gives it balance and symmetry. I like the contrast between the natural corn and the works of sculpture! This is a doorway intent on symmetry. Even the 36 is counterbalanced by the mail slot. Interesting capture. 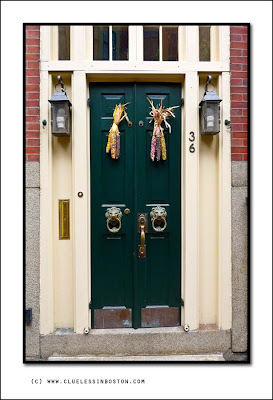 A very handsome doorway nicely decorated with the corn in preparation for Thanksgiving! To you and yours, Happy Thanksgiving! Everything in the photos appears crowded - narrow doors, light tightly fit into the recesses, door hardware, etc... Cool photo. Do you ever knock on these doors? Marvelous! They sure don't make them like that anymore. That is a very narrow door! It's pretty though and I like the decorations. Why two door knockers? Perhaps they make different sounds to alert different people! Very classy door. It looks a bit narrow, was it once a side or back entrance? I love Indian corn! The best fall decorations, in my opinion.